Staghorn ferns are members of the genus Platycerium. They make a nice houseplant and are relatively easy to care for. They can be grown year-round outdoors in areas protected from frost and freezing. In their natural habitat they can be seen growing high up in the crowns of trees. Staghorn ferns are native to tropical central Africa including Madagascar, southeast Asia, the Pacific islands and Australia. One species is native to the Andes mountains of Peru. 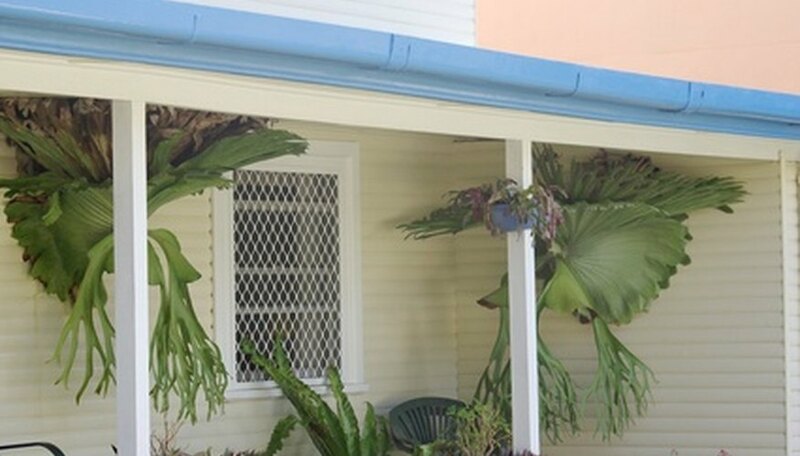 The popularity of staghorn ferns has lead them to be cultivated in other tropical and subtropical regions where they have become naturalized such as in Hawaii and southern Florida. Staghorn ferns have two types of fronds: sterile and fertile. Sterile fronds grow flat against the tree and are usually disc shaped. When they are growing, they are a light green color until they mature when they die off and turn brown, but remain attached to the plant. After several growing seasons, the sterile fern fronds build up creating a natural sponge to hold water for the plant during dry times. They also catch falling debris such as tree leaves that help provide nutrients to the fern as they decay. Fertile fronds grow from the same central bud as the sterile fronds but are usually held erect or hang pendulously. They are light green and usually covered with fine hairs and are forked, sometimes elaborately. They resemble deer antlers which is where this plant gets its common name. These fronds also produce spores in dark patches on the underside. Staghorn ferns are epiphytes and do not grow in soil. An epiphyte is a plant that grows on another plant but is not parasitic. It only uses the host plant as support and causes no damage. Some species have been found growing lithophytically, meaning they grow on rocks. 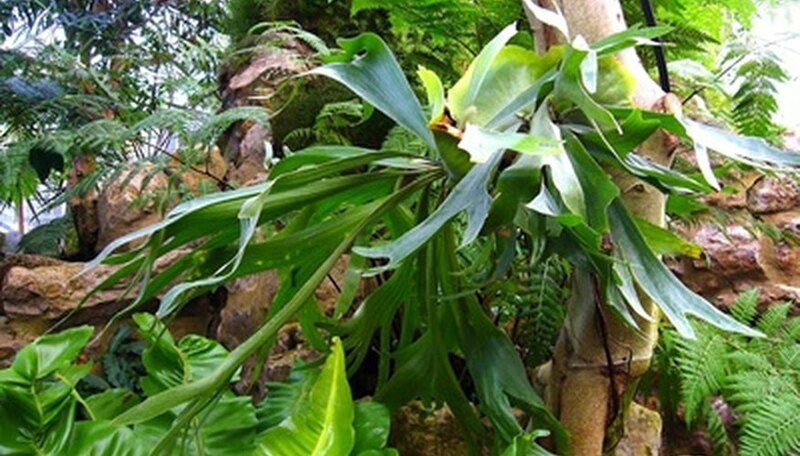 There are 17 different species of staghorn fern and several recognized hybrids and cultivars. The most commonly seen is P. bifurcatum which forms dense clumps of several plants often reaching 5 feet or more in diameter. This is a favorite because it has the ability to withstand brief temperature drops to 25 degrees making it suitable for year round outdoor growth in Florida, Texas and southern California. The largest staghorn ferns like P. superbum can get 5 to 6 feet across with fertile fronds hanging down 6 or more feet. There are several dwarf cultivars that may only reach 1 foot across with 1 to 2 foot long fertile fronds. Young staghorns can be grown in pots with well draining soil, but will need to be mounted when they start to get large. They can be mounted on just about anything, usually tree fern, redwood or cypress slabs, sometimes directly on a tree trunk or on rock walls. Eventually they will establish themselves and become attached to the mount. They like part shade and bright light. They prefer a high humidity level over 50 percent. Let them dry out between watering.